When the Rev. Andy and DeNese Newbill went to bed on Dec. 30, 2010, they were simply looking forward to “ringing out” the year with a family dinner the next evening. Instead, the couple found themselves at Cincinnati United Methodist Church, where Andy serves as pastor, preparing to aid a community devastated by a New Year’s Eve tornado. since the Dec. 31 tornado. 21 miles of devastation trailing from Cincinnati to Tontitown. Mid-day on Dec. 31, the small congregation (the previous week’s worship attendance was 17) opened the doors of its building to provide a staging area for volunteer agencies like the American Red Cross and Lions Club, as well as a depository for donations of food, water and supplies. simple—it was the church’s way to serve their neighbors in need. Andy Newbill agreed. He said it was a good chance for the church to live out Jesus’ command in Matthew 25:35 to feed, clothe and take care of people in need. “This was a mighty way for the church to be used in a disaster—even as small as it is,” DeNese Newbill said. on Saturday, Jan. 1, 2011. Cincinnati UMC soon found it was not alone. Others throughout the district and state began to mobilize to provide financial and physical assistance to the congregation. Denni Palmer, disaster response coordinator for the Northwest District, began to work with Andy Newbill—first by phone, then in person—to spread the word about the immediate needs. Palmer, who trains early response teams in the district, also served as Newbill’s liaison, helping the pastor field questions and donations from people throughout Arkansas and the country. A page on the district website (www.nwdist.org/2010/12/tornado) provided a place to post accurate timely updates. Newbill also used Cincinnati UMC’s Facebook account to update friends and ministry colleagues throughout the state with his personal experiences. He said phone calls from ministers throughout the conference and from Bishop Charles Crutchfield helped sustain them as they, in turn, ministered to those around them. “We knew our connection in the conference, but our connection in the United Methodist Church goes even beyond our conference,” he said. In addition to help from other United Methodist churches, various ministries and governmental organizations, including the American Red Cross, Washington County Emergency Management and Rebuilding Northwest Arkansas, set up at the church to provide resources to people in need. The Prairie Grove Telephone Company even set up a temporary phone at the church for use during the disaster. Janet McElroy of Fort Smith grew up in the Cincinnati community. After learning of the tornado and efforts to turn the church into a community resource, she decided to lend a hand. She spent much of the first weekend after the tornado sorting the donated items flooding into the church. She said watching people work together to support their neighbors helped reinforce that people still care about others. As the immediate needs of the community were met, Newbill turned from recovery to rebuilding efforts. Now, with the help of community leaders, he is working to raise and distribute funds to those impacted by the storm. In addition to using $10,000 provided by the Arkansas Conference Disaster Fund, the church established a Cincinnati Disaster Fund through Arvest Bank to help streamline donations pouring into the community. By mid-January, the Arvest fund totaled more than $40,000. Newbill said he hopes to distribute funds to people in need, especially those without adequate insurance or financial resources. Online donations can be made to the Arkansas Conference Disaster Fund at arumc.org/donate_now.php. These funds are distributed through the Bishop’s office to help meet the needs presented by the disaster. One hundred percent of all donations made through the Conference fund are used for disaster relief. 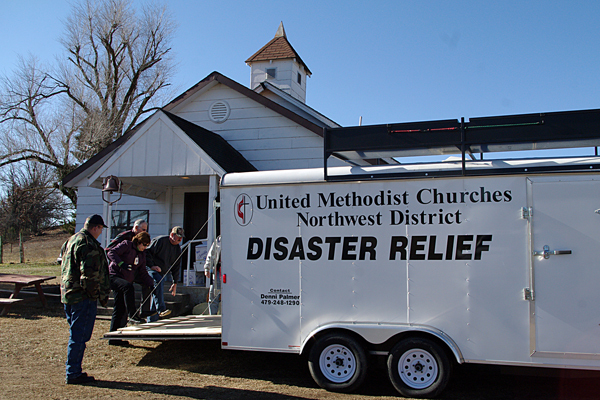 Andy Newbill said one thing helped him successfully care for his congregation and community in the aftermath of the Dec. 31 tornado: his decision to become certified as an UMCOR early response team (ERT)member, through training provided in 2010 by the Northwest District. “It gives you an idea of what a disaster involves and what you should not do—which is probably more important than what you should do,” Newbill said. Since Northwest District disaster coordinator Denni Palmer began leading the training in 2009, approximately 40 lay members and clergy have completed the one-day course to become certified ERT personnel, deployed by the United Methodist Committee on Relief (UMCOR) after the emergency phase of a disaster has ended. Palmer and other district disaster coordinators are working to schedule more ERT training events. For information about upcoming training events, or to volunteer in Cincinnati, contact Palmer at umteach@hotmail.com or 479-248-1218. Having grown up in NW Arkansas the tornado at Cincinnati really hit home. It was so great of this church to serve the community in this way. 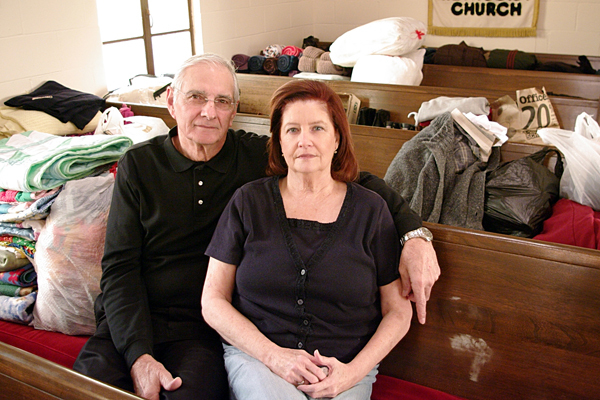 America's small churches do so much to help out that often goes unnoticed. Thanks for the great article.